The Apple Mac Mini MGEM2 is a state of the art minicomputer that comes with a range of trademark features. The machine comes with an Intel Core i5 processor, which is performance and power at its best. The Intel Core i5 is capable of handling complex and demanding applications while optimizing your power consumption. 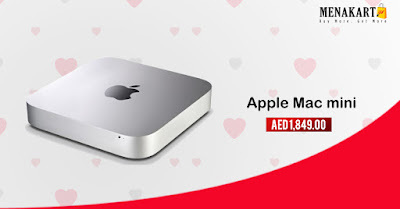 The standard model of Mac Mini has an Intel Core i5 with the clock speed of 1.5GHz and 2.7GHz with turbo boost over clock technology that enables you to get the best performance out of your processor. The Intel Core i5 is capable of handling operations that range from simple typing and word processing to graphics processing, video editing, multitasking, and advanced gaming as well. With a default 4GB RAM, the Mac Mini provides improved start up speeds and the ability to multitask. It also intelligently optimizes the power management by shifting the computer to and from the sleep mode. Besides this, the Mac Mini, features a configurable RAM slot that can be upgraded up to 16GB. The Mac Mini has a default 500GB hard disk space, which enables you to store large files like movies, games, etc. The OS X Yosemite of the Mac Mini works flawlessly and is compatible with a wide range of softwares. The Mac Mini doesn’t fall short of connectivity and provides you with a good Bluetooth connectivity, WiFi, and an Ethernet port.